With the mark of the year 2016, Evince embarked on a new journey with the Citizenship and Business Department of Ministry of Interiors, Nigeria. The journey to empower the Nigerian citizens, the journey to provide them a digital platform for their legal handlings. After lots of research, documentation, continuous efforts and 30 months of hard work Team Evince has finally delivered the Nigerian government portal eCitibiz to be used by the mass population of the country. Once again Evince has delivered growth in accordance with the expectation. Managing the retirement benefits of retirees in Paramilitary Services under its supervision. The Ministry is committed to providing services in accordance with International standards. They wanted to build up Multiple modules like Marriage, Citizenship, Place of Worship, and Expatriate Quota, they wished to build a management system to handle applications for a variety of tasks related to the modules. The main aim was to make legal process easy for the citizens of the nation. While developing eCitibiz Portal the biggest challenge faced by Evince was to build an interactive web application for the mass population of Nigeria with a decent UI and a smooth process with clear instructions to perform every task. We had to go through 60+ manual paper forms to understand the basic requirement and to understand the relationship and dependency of each available field to create a smoother workflow. As eCitibiz was going to become a data-rich government portal containing confidential and personal mass data, its security and scalability was our major concern. Amongst various other challenges faced were generalizing the payment system for all applications, implementing a sophisticated Audit log and implementing private chat functionality for both the guest and registered users. After going through all the documents provided by the client, Evince had a good understanding of their requirements. We came up with the solution of developing a Management Module to manage the flow, tracking application, logging, payment details and all the other activities happening on the portal. For payment security, we integrated the portal with Remita Payment Gateway functionality. A chat module is also implemented for logging, tracking and saving chat information for use in future. As security of the portal is the biggest concern, Evince structured the site architect where no SQL injection is possible. Provided security step and verification for login if the user forgets the password or in case the user tries to access different accounts. Evince follow its own approach for software development which is the combination of various SLDC models as hybrid execution model start with Prototyping, Iterative and Scrum Methodologies. The team dis a detailed analysis of the requirement and project plans for developing a project approach to have the most effective solution that fulfills the client’s requirement. All the blueprints and the designs for the portal were prepared and were sent for client’s approval. After the approval of Nigerian Ministry of Interiors, the development was started. Once the development was over, a stepwise Quality Assurance Test was performed. 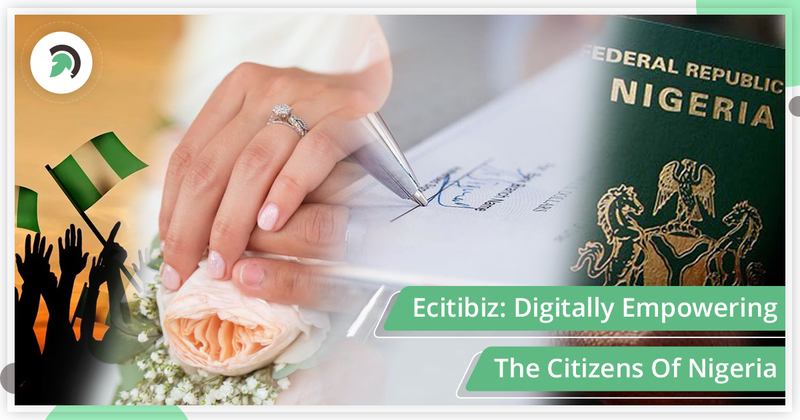 With the approval from our QA team, we were able to successfully deploy the project to the client on 4th September 2018.
eCitibiz has provided the Nigerian population with a digital platform to manage their legal handlings with an ease. It also helps them to maintain transparency of their data. By developing eCitibiz, the Nigerian Ministry of Interiors has set a classic example for ministries around the world of empowering people to manage the tedious and troublesome legal tasks. They have set an example of creating a solution for performing their tasks at a faster pace and more effectively, parallel maintaining the transparency for their citizens. Evince Development is a team of passionate, hand-picked professionals offering the complete technology services. Evince Development is helping companies to innovate in the software, e-commerce, mobile solutions and the next generation of cloud, to achieve sustainable business growth, and deliver a reliable IT solution. Our main offer is consulting and IT development, business IT solution and UI / UX design. Evince strives to provide technology to its customers around the world while maintaining transparency, integrity, and ethics. It also strives to achieve customer satisfaction through quality service at competitive prices. Evince is a dynamic IT development companies and solution provider. Apart from its core service offerings, Evince is also providing services such as PR and Marketing Services, Recruitment Services in Europe and Translation services in most of the languages with the help of its channel partners.